If drainage may be an issue, you might want to consider growing your Tomatoes in a raised planting bed. Raised beds warm up earlier in the spring and will ensure good drainage. 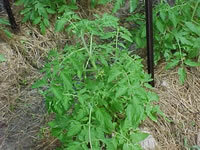 An actively growing Tomato plant needs about 2 gallons of water each week. Water regularly and deeply after the weather begins to warm up, to keep the soil evenly moist, but never soggy. Container grown plants may need more frequent watering. Use care not to wet the foliage because that leads to a higher instance of both bacterial and fungal disease. After the soil has warmed, apply a layer of mulch to control weeds and hold in heat and moisture. Black plastic works well as a mulch for Tomatoes. and then begin regular applications as soon as fruit begins to form. Always follow label directions closely for the best results. Check plants regularly for diseased leaves or plant parts that appear diseased. If disease is found, throw the entire plant into the trash. Do not throw them in the compost pile! After the growing season ends, remove all the Tomato plants from the garden and throw them in the trash. Rotate crops yearly to help keep soil diseases from striking other members of the Tomato family. Should Tomato Plants be Pinched? Some people choose to pinch or deshoot the side shoots that emerge where the leaves join the main stem. This will result in earlier and larger, but fewer Tomatoes on each vine. you will create a bushier plant with somewhat smaller but a more abundant harvest. The additional foliage will serve to provide needed shading for the fruit from direct, hot sun to avoid sun scalding. (5 gallons or larger) and have very good drainage. Use a quality potting soil mix that does not contain fertilizer unless you want more foliage than fruit!. or they can be allowed to sprawl along the ground. Staked plants take less garden space and are easier to work around. Use a sturdy, six foot stake, set a foot deep in the ground at planting time. Once the plant attains sufficient height, secure it loosely to the stake. rather than cutting into the stem, as string will do. to keep stems from rubbing or being choked. Add more ties as the stem grows. in rows that are spaced 3-4 feet apart. Many gardeners prefer to grow their Tomatoes in manufactured or home made Tomato cages. Manufactured cages are made from stiff wire and may be square or round. They are quick and easy to use but there are limited heights available and no way to extend them. They can get expensive if you are growing a large crop. They also tend to be a bit flimsy. If you are growing more than just a few plants, you can cage your tomatoes using different methods and materials. The "Florida Weave" involves two rows of t-posts (or other sturdy posts) spaced 2 ft. apart. Additional pairs of posts are added every 3 or 4 feet as needed. Fasten heavy gauge wire to each post, 12" from the bottom. between the wires so that each side of each plant is supported. When you reach the end of the row, tie the twine off then reverse direction until each Tomato is woven in on all four sides. Add a second wire half way up each post, and another wire about 12" from the top of the post. After this point, you will be able to easily weave your twine horizontally, vertically or diagonally as needed to support your Tomatoes. Field fencing is often used to make 'cut to order' Tomato cages. large enough holes that you can reach in and retreve your Tomatoes! Always wear heavy leather gloves when working with field fence! 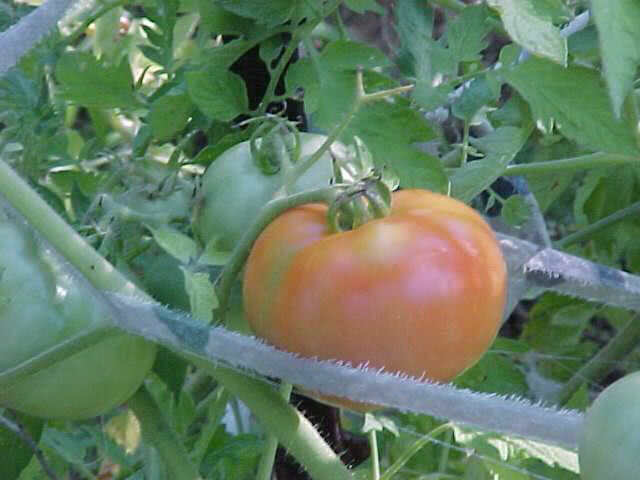 Many gardeners choose to just let their Tomato plants sprawl along the ground. straw or dry leaves to help keep the plant and fruits from direct contact with the ground. and will make it easier to control slugs, snails and other pests. Tomato plants that are allowed to sprawl should be grown 3 ft. apart, in rows that are 4-5 feet apart. produce fruit until they are killed back by frost. They are capable of growing 8 ft. or more in a season. Recommended types: "Beefmaster", "Better Boy", "Roma", "Sun Golsd"and "Sweet 100". 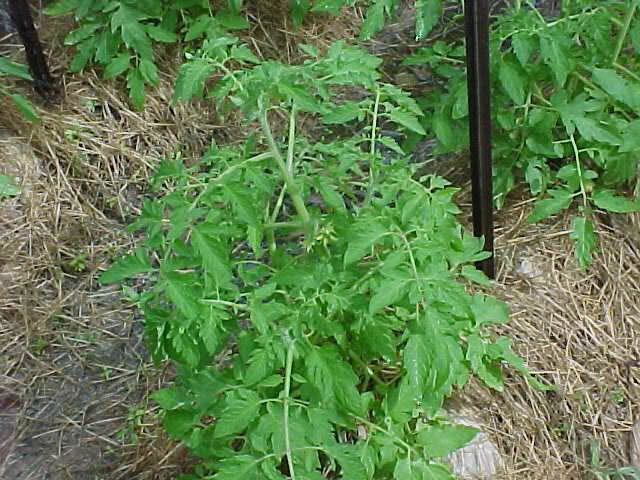 Determinate Tomato Plants are compact bush and dwarf types of Tomatoes. shortly after the initial flush of fruit. This type includes "Husky Gold", "Pixie", "Rutgers", "Razzleberry" and "Viva Italia". Select disease resistant varieties of Tomato that are suited for local area. Verticillium Wilt, Fusarium Wilt and Root Knot Nematodes. You may also see additional letters affixed to the hybrid. A indicates a resistance to Alternaria alternata, Crown Wilt. L indicates a resistance to Leaf Spot, Septoria. St indicates a resistance to Stemphylium, Gray Leaf Spot.